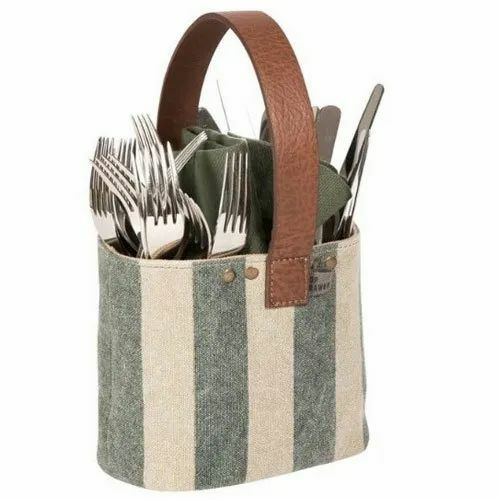 Being a quality oriented organization, we are involved in providing a supreme quality range of Cotton Canvas Cutlery Holder . “Hamza Leather Exports” is a Sole Proprietorship based entity, headquartered at Chennai, Tamil Nadu with well-equipped facilities of manpower and machineries. Since 2009, it is ardently engrossed in the occupation of manufacture and offering a flawless range of Leather Belt, Leather Pot Holder, Leather Tea Coaster, Men's Leather Jacket, Leather Bag and many more. The concentration of our firm is on developing an enhanced tomorrow and that’s why it is dedicated towards excellence and always tries to do pioneering implantations to become a future corporation.